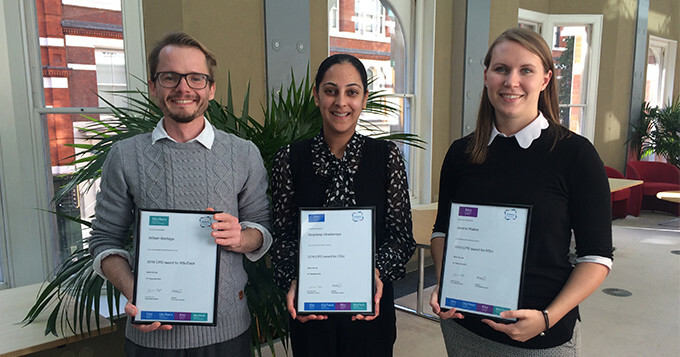 Photo (L-R): William Bardega, Amardeep Ghattaoraya and Jemma Walker. Each year the Science Council hosts a day-long forum to discuss issues facing both Professional Bodies and individual Registrants around CPD. The theme of the forum this year was ‘reflection’, an area often identified as being tricky to tackle. How do you monitor reflection and more importantly, what does good reflection look like? Gordon emphasised that no one ever truly stops learning and that reflection is a critical part of the learning process. Reflection is not something you only do after attending an event or reading something new, but also before and during those activities to make sure you maximise their benefits, to yourself and to those who use your service. This year’s forum saw the second Science Council CPD Awards presented to the winners and commendations. The award is designed to celebrate the efforts and achievements of our Registrants and to offer them recognition for their broad and diverse range of professional activities. Each Licensed Body was invited to nominate up to two Registrants from each register and the judging panel then awarded a winner from each register, and one highly commended nominee. The forum provided an opportunity for Licensed Bodies to network and share ideas and best practice, as well as to hear directly from their Registrants on issues that concern them.